Friends of Real Lancashire have been established since 1995. Our aim as a group is to promote, protect and preserve the true identity of the county of Lancashire. The need for our group came about mainly after the Local Government Act of 1972, which reorganised local government areas throughout England and Wales on 1st April 1974. 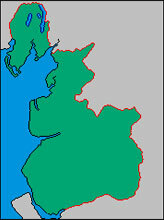 In relation to the North West, it created the administrative areas of Lancashire, Cumbria, Merseyside and Greater Manchester. The re -organisation was never intended to create new counties (as official statements support) but nevertheless, mainly because of the local authorities, these areas were on the face of it deemed counties and centuries of tradition was seemingly eroded. Since it was established the Friends of Real Lancashire has helped to found Lancashire Day; created (with the help of the Flag institute) registered the Lancashire Flag and paid for and erected boundary signs in many Lancashire areas, for which work which still continues. In 2000, the Friends produced a limited edition modern map of Lancashire with Ordnance Survey and has liaised tirelessly with local governments, politicians and the media to correct the inaccuracies that still propagate and exist. We are an a-political group run by volunteers and we are always looking to hear from new people interested in supporting our cause. Friends of Real Lancashire was created for people and not for profit. Greater Manchester, Merseyside or part of Cheshire.